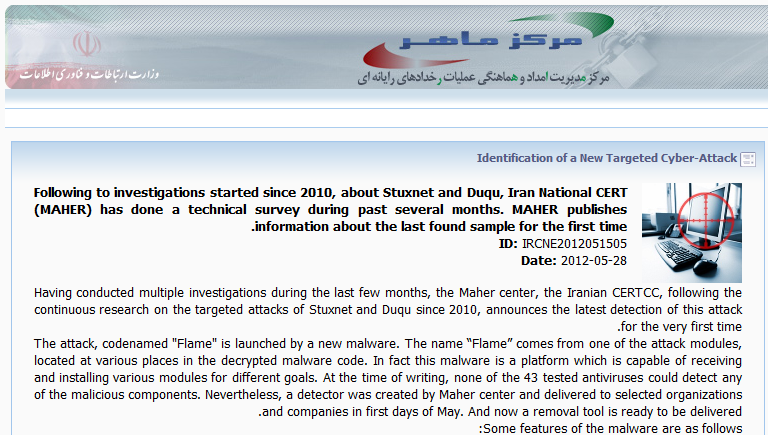 Yesterday Iran’s Computer Emergency Response Team released a warning about a new modular malware that resembled Stuxnet and Duqu. Dubbed “Flame”, the new cyberweapon is causing quite a stir in the media with it’s “advanced features and complexity”. All of these “threats” have been seen before. I especially liked the “bypassing tens of known anti-viruses…” line. But there are several features that do set “Flame” apart from the pack. First of all the malware is very large, a whopping 20MB. Also, it contains several files and seems to be able to attack using swappable modules. But there is more. All the big name security companies that have analyzed it seem to agree that with it’s complexity, it was most likely written by a Nation State and not individuals or small groups. The malware could have been created by Israel (and possibly the US) as many of the countries that have detected infection would be logical targets for them. I am not sure of it’s “CyberWeapon” title, as it seems to be an information gatherer. Definitely worth keeping an eye on, but as with “APT” and “Stuxnet”, I am sure the media will beat this topic to death.